ToB: The book is full of incredible detail. Did you write sections as you were hiking? I found myself wondering how you would otherwise capture the environment with such immediacy. Andrew Wilson: I’m very pleased you experienced my writing that way! As anyone who has written a travelogue can confess, the membrane between the immediate experience and later reflection is highly permeable. The exigencies of travel, and even more a walking pilgrimage, make time and energy for articulate reflection scarce. My wife and I each kept our own records during the trip, and I used all that I had available in my composition—particularly the 12,000 photos I took of everything along the way. We talked long and deeply while afoot, and the seeds for what would become the book were sown. But the raw material required much processing to become the final product. Andrew Wilson: Walking is perhaps the most natural of human bodily activities, and as a species we are well adapted to walk such distances. For your average person with decent health, and who has the leisure to begin more gradually, I don’t think much training would be necessary at all. 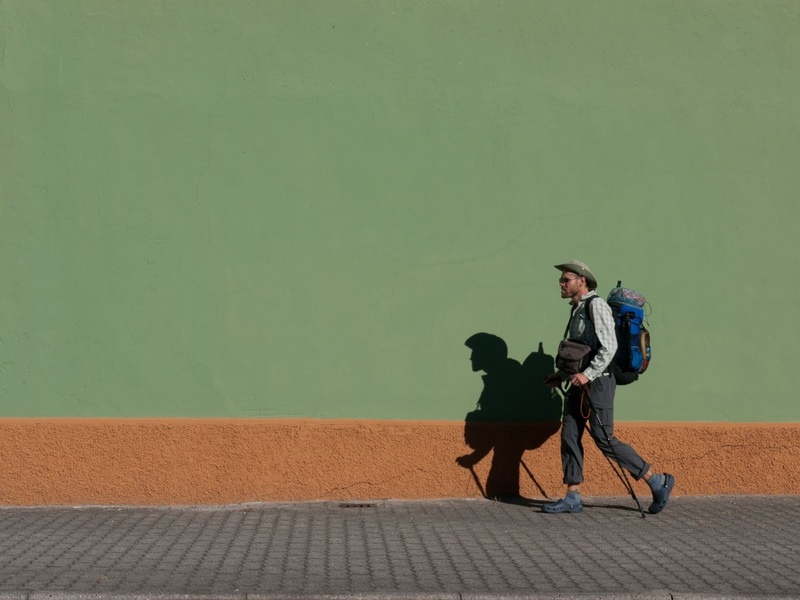 But as we were pressed and had to start off strong, we did train for several months by walking 10 km twice a week, with longer walks on weekends—and with increasing loads in our backpacks. I have done long treks before, most notably the Oregon and Washington sections of the Pacific Crest Trail (a similar distance, about 1000 miles), and knew that training was necessary to avoid tendonitis or other repetitive stress injuries. While our pace might seem swift for the uninitiated, those who’ve done such treks will recognize that it as hardly superhuman. We walked more slowly than Luther did by far--according to our sources he walked 25 miles a day, or more! ToB: This was an ecumenical project, hinging on the issue of pilgrimage. 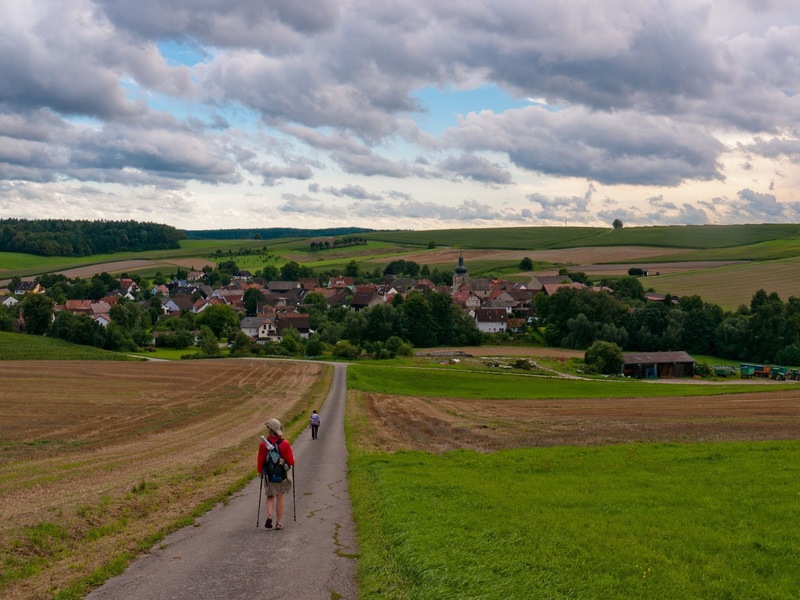 Did you find the common space between Catholicism and Protestantism in this modern pilgrimage? Andrew Wilson: The historian in me hesitated even to use the word pilgrimage. 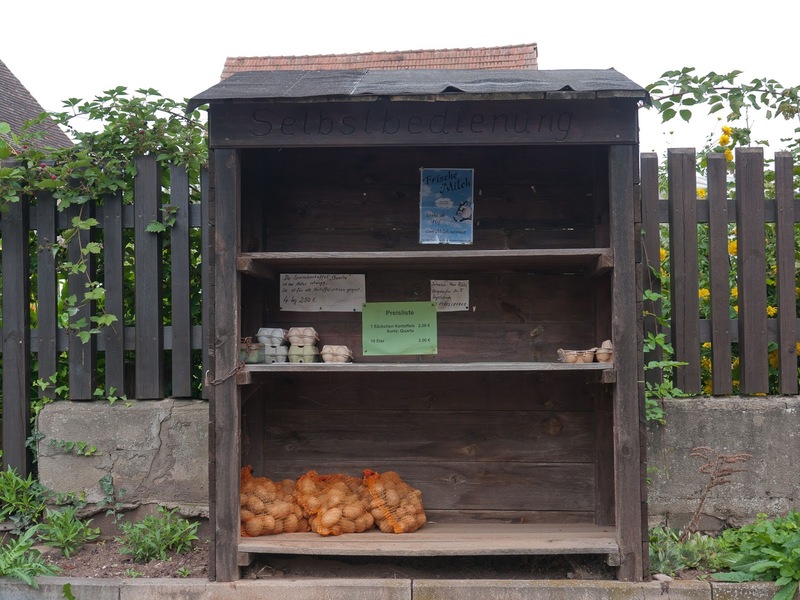 We are Lutherans after all, and Luther came to hate pilgrimages as wasteful objects for human energies, the ultimate in frivolous so-called “good works,” just one small step above indulgences. He would object still further to a couple following his own steps in a reverent way, as if his passage were somehow holy. But exactly what counts as a pilgrimage has shifted quite dramatically in the past few decades, and few and far between indeed are those who walk according to the logic of religious penance that Luther criticized. 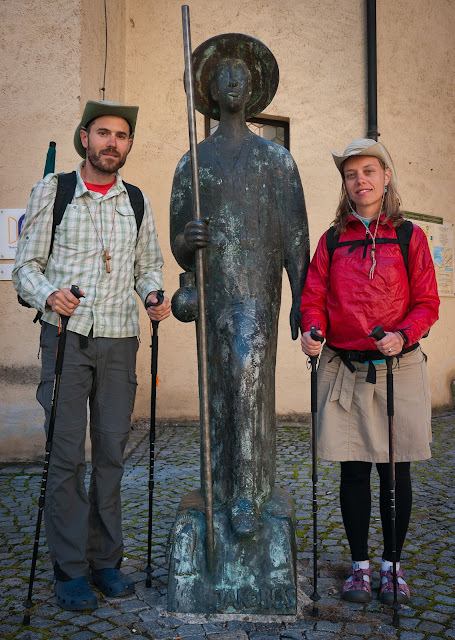 There are still some traditional pilgrims intent on holy sites and relics and their proximity to God, but most people out there walking the old trails are much more vague about what they’re up to. Some want to lose themselves in an alternative, accepting community; others want more history from their hike than endless stunning mountains. As for ourselves, we hoped to illustrate the recent healing between Protestants and Catholics by reconnecting Luther’s Germany to Rome with our own feet. I think there’s space within the historical and theological heritage of pilgrimage to encompass a wide set of practices. 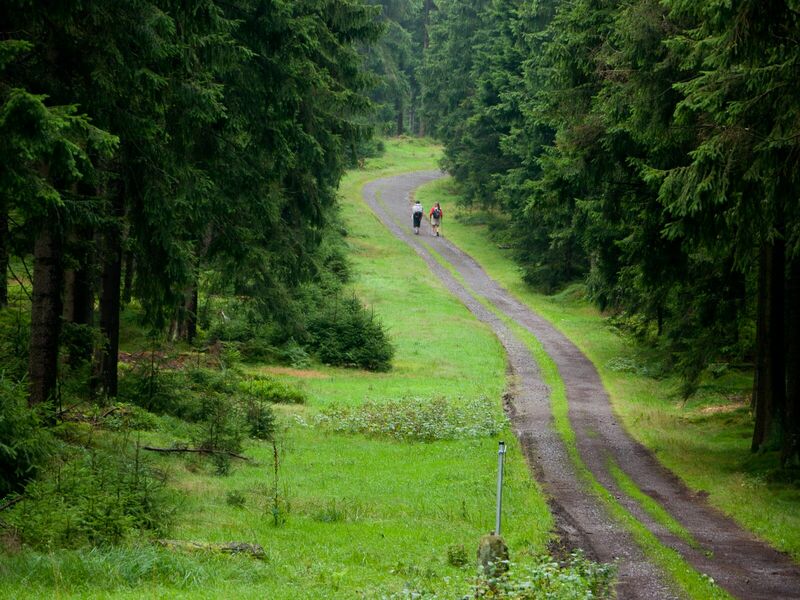 Walking together on the same path toward a distant goal is about as good an metaphor for ecumenism as I can imagine. ToB: Your book gives a rich account of the environment as much as it considers religion. Let’s start with a question that many people might not automatically consider when talking about the evolution of religion. Do you think that the environment may have influenced Luther’s faith and criticisms of the Church? There is the famous story about how he was set on his religious path after almost being struck by lightning. He also lived in German lands which were still alive with pagan superstition about the natural world. 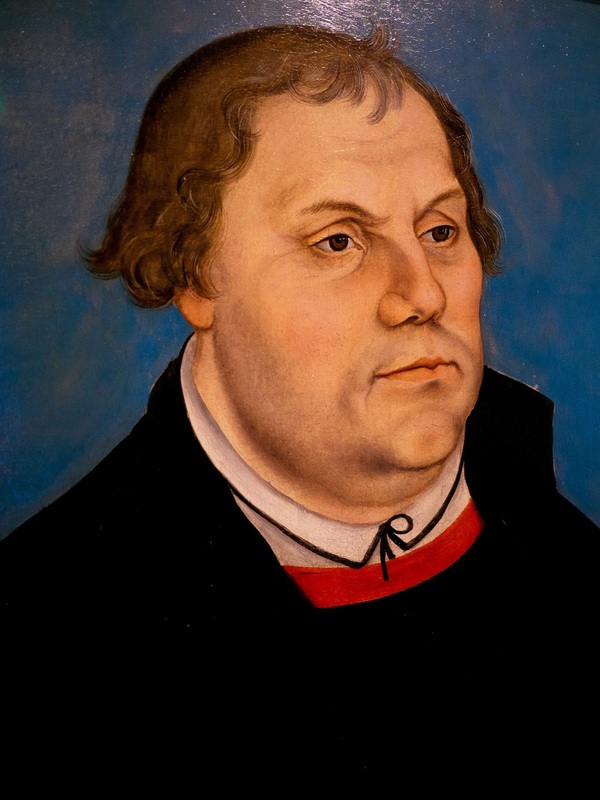 But could you say that Luther’s Protestantism was somehow a product of the divine in that German landscape? Andrew Wilson: Later idealist philosophers certainly read Germany into Luther, but we should resist such Blut und Boden hints with full ferocity. 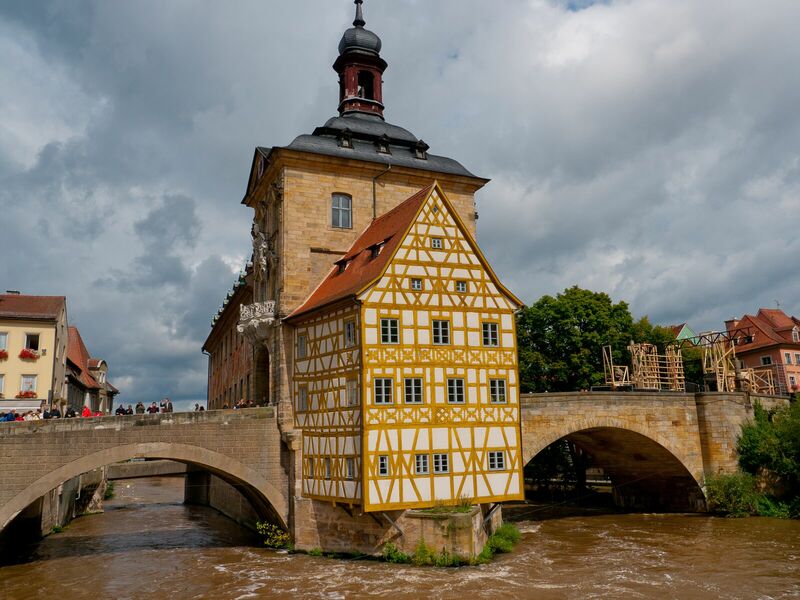 Luther’s home of Wittenberg was, as he described it, at the edge of the world, but it was still within the Holy Roman Empire. The superstitions he railed against in his own writings were not a hidden pagan palimpsest but of Christian origin—Christ had become so distant, untouchably holy, and all-powerfully frightful that the people placed their trust idolatrously in saints and human works. That Luther and contemporaries read the weather, stars, and happenings as full of portent is well noted—he often ribbed his friend and colleague Philip Melanchthon’s dedication to his horoscope. But this was much more like a proto-scientific use of human reason than dangerous speculation. When Luther later lobbied for what was “German” it was not to weave pre-historical layers into some sort of meaningful substance, as did the later nation state. He was a humanist in this regard, and fought ignorance with knowledge. He felt that even common people should comprehend their faith intellectually, and be able to articulate it with their words as well as bodies. Literacy, and translation, and publication were a large part of this agenda, activities that demanded lively local metaphors to bring the distant world of the Bible to life. His Scripture commentaries and sermons identify Germany with ancient Palestine, not the other way around. Andrew Wilson: In my preamble I quote Lucien Febvre at length, who stunningly claims that that the Reformation was complete after Luther saw Rome’s corruptions. It makes a nice rhetorical bang, but it’s just not true at all. The Papacy’s decadence and depravity were notorious, and openly attacked in various ways, especially by mendicants, right through the Middle Ages. Historians have been quick to fixate on grand revolutionary, political themes that cascaded from Luther’s original protest, but these make it difficult to see Luther the late medieval monk. In conceiving our ecumenical project, we sought to take advantage of Luther’s silence about the places in between to emphasize what gets lost in the later polemics of the Reformation proper. That is, the pre-Reformation Luther was full of living, active, practicing, late-medieval faith. So often we hear that Luther left the Catholic Church and started a new religion. Not only did he not leave (he was excommunicated and placed under imperial ban), but he maintained most church practices and teaching intact. This is mostly ignored, however, and the differences that arose have been magnified ever since. As we walked—and as I wrote—we labored to see the sites as he might have seen with simple faith, but also with a growing independence. One of the unfortunate side effects of the Reformation was the exile of whole schools of theological minorities who were formerly full participants in catholic faith and life. The Reformation cut off several healthy branches from the Western Catholic church. Everything falls short. This leaves a mystery about past experience, something inaccessible and inviolable. Did you reach any conclusions about that mystery during your journey? Andrew Wilson: I think I had a schoolboy’s hope of authenticity at the outset, a kind of Romantic, American-West hiker’s narrative of going into some unspoiled wilderness. 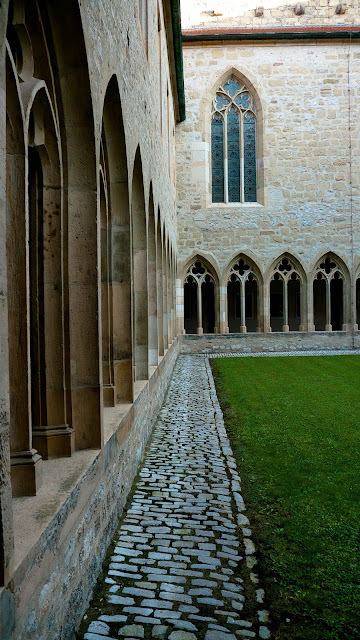 My experience of the Priory in Erfurt was repeated all the way to Rome. Contrary to my initial expectations, there is no unspoiled wilderness, and I had to put on archaeological goggles to see through all the layers. A landscape is as thoroughly edited as an ancient text; it is the capacity to see all the erasures and lacunae that is most elusive and rewarding—and it requires a lot of time and study. We are constantly choosing what pasts we prefer, if only by each generation’s repeated choice to renovate one building and let the other slump into the ground. There is no such thing as an authentic antique edifice. Texts are no more edited than buildings—and perhaps even less. I’d rather get my Luther from his writings than his renovated house any day. Luther in Coburg (20 November 2012): in 1530, Luther stayed in Coburg, when he was translating the Old Testament into German. (pp. 31-35) For subtitles, click 'CC' then 'settings' and 'auto-translate.' Video Source: Youtube. ToB: Luther sought to reaffirm and perfect faith by returning to the earliest religious texts and translating them. (p. 33) That is a search for authentic faith, encased within a rediscovery of an authentic history. (p. 41-42) That is a very medieval mindset, normally obsessed with relics as direct, physical connections to the ancient world and its holy figures. (p. 23) But in Luther’s case, he transferred that obsession from relics to texts, and thereby inadvertently revolutionized and standardized language, and modernized popular Christian faith. Did you find any parallel with the medieval yearning for the authentic past in your own attempt to retrace Luther’s steps, from this time, to his time? Andrew Wilson: It seems strange to say, but intellectualism is indeed the preferred heresy of Protestantism’s less reflective ideologues—that is, a fixation first of all with thoughts and states of mind. To this the revivalists added the affections (and the subsequent dependence upon subjective religious experience). It’s a strange and somewhat comforting sight to see the stream of anti-Catholic Evangelicals traipsing about the Holy Land, consuming the twenty-first century equivalent of pieces of the true cross: the historical nature of Christianity will not be denied. There is certainly more than a tinge of Golden Age-ism among these modern pilgrims, as well as their medieval pioneers, a sense that the bright light of the apostles and martyrs had grown dim and could be rekindled by physical proximity. As I mentioned, any illusion about authenticity was dissolved fairly quickly—in fact, whenever I would drop into that nostalgic state of mind, a jet plane would fly over or a plaque would announce “Built in 1703” or some such disappointingly late date. By walking the whole distance—not lingering long in city centers under real and regulatory glass—we were repeatedly robbed of any pretense. If anything, the constant editing and renewal of the landscape vindicates the turn toward texts. They are much more durable and comprehensible than disintegrating buildings and disappearing ways of life. 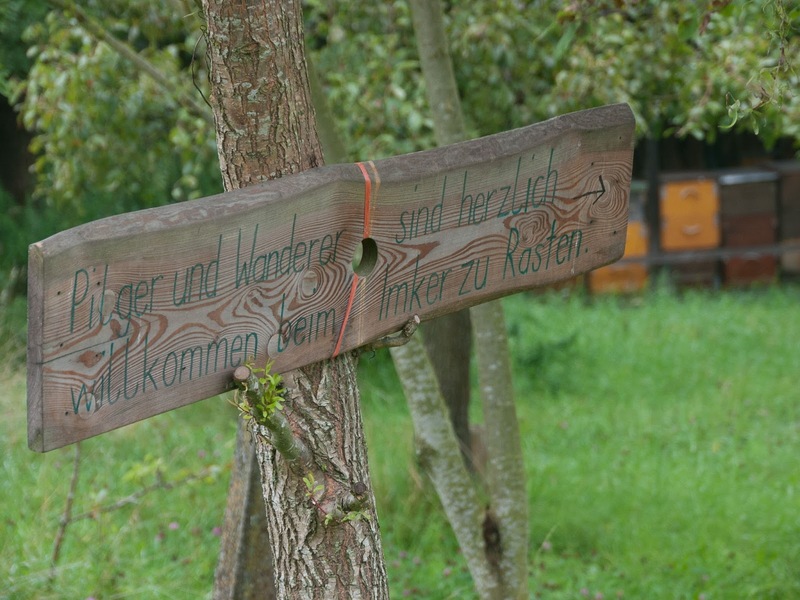 The sign reads: Pilgrims and hikers are warmly welcome to rest with the beekeeper. ToB: If faith involves some apprehension about the past, at the same time, you depict God as a nomad, a traveler occupying the eternal Now, part of the constant, created flow of the world, including entropy. (pp. 25-30, 38-39) Isn’t He rather omni-temporal? Andrew Wilson: This is indeed a traditional attribute of God according to the Christian faith. This dose of metaphysics can be illustrated by two parallel stories interwoven in both Scripture and theology, right back to the first chapters of Genesis: God creates the heavens, and then God is walking around the garden of Eden. The Christian solution to this metaphysical dilemma—a theme emphasized by Luther—is God’s temporal incarnation in Christ, who becomes the cusp of time, so to speak, and whose ministry in Galilee and crucifixion in Jerusalem are carried toward the eschaton by the body of the church. The Son of Man, says Jesus, has no place to lay his head (Matt 8:20; Luke 9:58 ). But the faith is also brought ever into the present by real people who lived and died, and whose remembrance testifies to God’s humble means of frail transmission. We are historical beings after all; and our comprehension has some limits. Andrew Wilson: This was certainly one of our most memorable encounters. And I reflect upon it at such length so as to highlight an insight of Thomas Aquinas’s that was just plain obvious to most medieval thinkers: God was at work in pagan peoples before the coming of the Gospel, sustaining them and even giving them great wisdom. Evangelism isn’t all chopping down sacred oaks—as did Boniface—but baptizing, purifying, commenting on pre-existing belief. There are doctrinal limits to this syncretism, of course, but our stock image of thuggish missionaries denouncing idols is incomplete. Grace, in the Thomistic tradition, perfects nature. There is another theme, though, more emphasized by Augustine and later Luther—that of death and resurrection—of sin and of redemption. Nature was created good indeed, but was soon infiltrated by sin. The nature and extent of this corruption, and how and when it will be purified, is the perennial discussion of Christian moral thought. So yes, there is a continuity, but a purification, too. 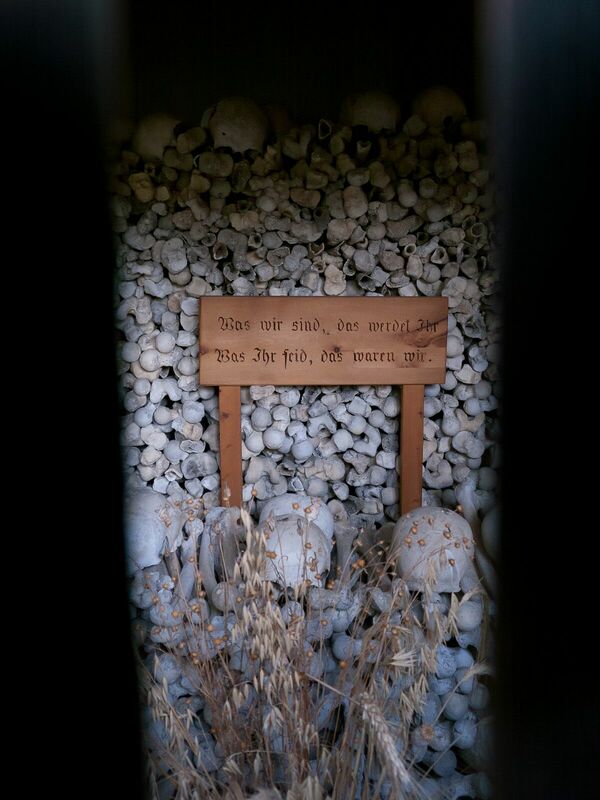 The sign at the charnel house of Alvaschein reads: "What we are, you too shall be. What you are, we once were too." ToB: Your encounter with the parish charnel house in Alvaschein is a reminder that the medieval mind was constantly preoccupied with eternity. (p. 109) Do you think our own relentless focus on the past, present, and future, could benefit from an added temporal sensibility in relation to eternity? Andrew Wilson: It’s important to recognize the particular nature of medieval—and Luther’s—eternity, which was unfortunately less philosophical than mathematical: priests and indulgence hawkers proclaiming so many millions of years of painful purgatory in the numerator as shriveling into nothing compared to the eternity of the denominator. What medieval Christians—Luther included—most longed for was less a temporal sensibility than the presence of the eternal God. This is why the mass was so sacred, where one could corporeally ingest God’s being. This is also why saintly relics were revered—as material windows into the inbreaking presence of God. This is why the religious orders cared for the sick and orphans—who as the “least” (Matt 25)—were sacramental tokens of God’s presence. Thinking about eternity in se is a dangerous spiritual business—apt, as we learn in the Hitchhiker’s Guide to the Galaxy’s Total Perspective Vortex, to manufacture insanity. Luther’s own spiritual advisors urged him not to contemplate God’s being in itself, but to meditate on Christ, God’s chosen incarnation: that was an object comprehensible by mere humanity. As a believer and a scientist at heart, I certainly wonder at the vast and austere beauty of the heavens. Zaphod Beeblebrox was only saved by his own delusionally huge ego. Is it superior to smugly dismiss humanity as insignificant against the infinity of the universe, than to have faith that our existence in this vastness is a grace? ToB: You have beautiful passages about the rotting vestiges of Communism (pp. 19-20) and the evident local desire to preserve Luther’s historical legacy instead. So I’ll contend with (or perhaps complement) my question above, regarding whether or not Lutheranism emerged out of a northern Germanic interaction with the environment. Does all of this amount to defining Lutheranism as some sort of European struggle with the concept of time? Does Lutheranism centre on a specific awareness of time and space and the environment, all embodied in faith? Andrew Wilson: I was just in Wittenberg for the celebration of the Reformation’s 500th anniversary. It was a confusing affair: Angela Merkel (herself a pastor’s daughter) gave some speeches noting both the importance of religion and religious tolerance. Church dignitaries urged members to carry on the brightest bits of Luther’s torch, and not descend into eternal struggle with Catholicism, even less so with the Jews (an indelible sore spot for Luther aficionados). The city itself, spruced up in recent years, was on the day of the celebration populated by a medieval Renaissance fair: jerkined men and corseted women huddled around crackling open fires roasting fatty pork to sell for 4€ a stick. 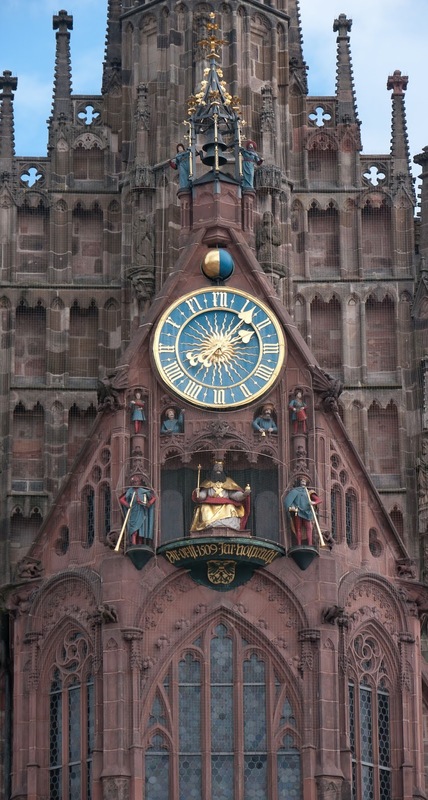 In the city square, around the statues of Luther and his colleague Melanchthon, a festive crowd milled silently about, enraptured by an audio and video fantasia that was projected across the façade of the city hall, waiting for something more exciting to show up on the screen, and nothing ever did. In his letter to the German Princes, urging them to create schools, Luther notes that God’s Spirit is itinerant: that the Jews once had it, then the Greeks, then the Romans, and now, for a brief period, the Germans. So, I don’t think Luther had any doubts that the torch would pass. This is harder for us less apocalyptic souls to come to grips with—particularly Europeans. Looking around the world, though, Luther’s comment rings true: the largest and most lively Lutheran churches in the world are not in Germany or Scandinavia but in Ethiopia, Tanzania, Madagascar, and Indonesia. I would like to know, five-hundred years from now, how they will commemorate the coming of the missionaries in the nineteenth century. Andrew Wilson: After Wittenberg we visited friends in France, where there is a real communist party, and where anti-capitalist (or “capitalism-questioning”) is de rigueur. Banter is quite lively, but I’m never sure what exactly is meant by capitalism. Weber means simply the accumulation of capital (as machinery, not just financial products)—which is then put to work to increase the efficiency of production. More recently historian of early modernity Carlos Eire has suggested that the amount of money caught up in the business of death in Southern (i.e. 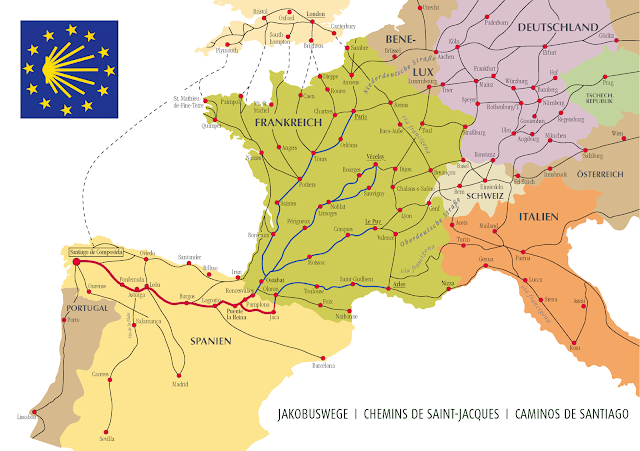 Roman Catholic) Europe was enough to account, over time and with the effects of compound interest, for the varying economic fortunes of the North. Be that as it may, I think that in such sweeping conversations we assume too much conspiracy: if there’s wisdom left in Weber it’s the other way around, that it is lots of little people’s affections and wallets that shape economies. You can visually see the differences on the ground. And here there is little doubt that Protestantism introduced a new vigor into civic life. 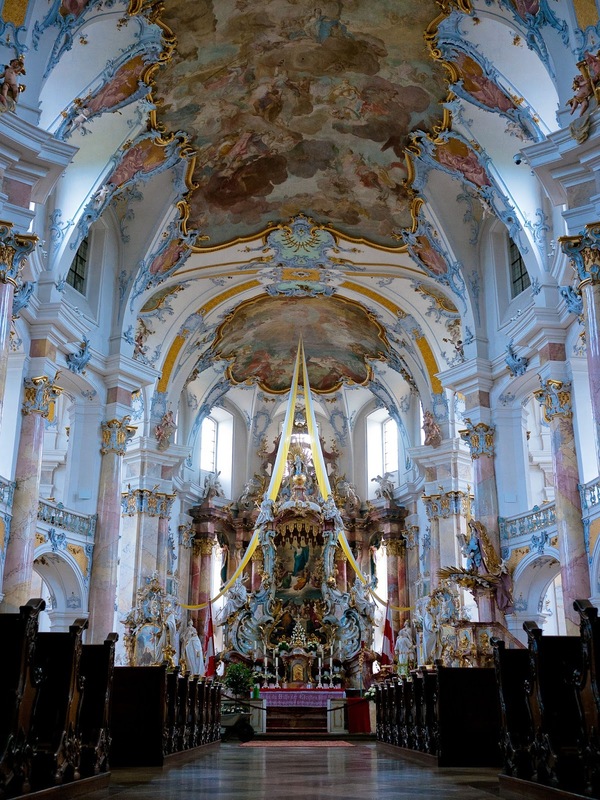 Just visit St. Georg’s church in Nördlingen, ringed not by images of emaciated holy men, but giant epitaphs erected by nobles and wealthy guilds. The sturdy social bulwarks of the city were the sturdy bulwarks of the faith as well. This demanded a very different relationship with clergy, by the way, who now had to contend morally with invested, mighty men, and hence themselves became a kind of parallel, educated elite. What this has to do with the capitalism of the banks—both Vatican and Wall Street—I’m not quite sure. But there are prophets who are always unwelcome in every land. ToB: You make a great comment on why veneration of the saints – something Protestants eschew – was so important to medieval Catholics. (pp. 50-51) Veneration of the saints was comforting and made an otherwise-forbidding-medieval God more accessible. Meanwhile, you state that a framework of secular and post-Protestant institutions, corporations, services have in fact filled needs once filled by Catholic faith. For example, modern insurance policies replaced a whole arm of Catholicism. Would you comment further on modern non-religious industries which we use to keep faith at bay, so that we can tell ourselves that we live in rationalist and secular societies? Is the whole modern world full of constructed and delusional proxies, desperately filling the role of, while denying, faith? Andrew Wilson: Europe and America seem to have put the theological question of insurance to rest, but I heard an Indian evangelist speak awhile back, and the principal mark of his conversion, he confessed, was the immediate cancellation of all his insurance policies. This was the exclamation point of his of trust in God. There was—and still is—a lively debate about such things in various times and places. I would love to see a history written about the subject. I don’t want to be dismissive, though. Medicine, science, and even the financial and insurance industries have done wonders to minimize the potential for absolute physical or financial ruin. But let’s not forget, either, that it was the religious orders, the deaconesses, and the fraternal societies that formed the initial structure for our modern safety net. If anything it is the welfare state itself, and less our rational secularism, that confuses things. The admirable desire to socialize these practices into a manufactured political body has many unintended consequences. It transfers what ought to be charity—that is, people taking care of people—into the realm of legislation, which at once creates a right and a dependency. And in some tacit way, the whole system wants to make death illegal, or at least minimize and postpone it statistically. We only like to deal with death and crime in our beloved police procedurals. I am heartened by the growth of palliative care and other active recognitions of mortality. My good friend Ephraim Radner, who teaches at Wycliffe College in Toronto, has written an wonderful and thoughtful extended reflection on the theological significance of time and mortality, Time and the Word. Christianity confesses the resurrection of the dead. But we will still die and suffer in this life: perhaps less so and less acutely than before, but still inevitably. I don’t want to push some overly Holden Caulfield sort of sophomoric death obsession. Death is still named an enemy by the Apostle Paul. But under the announced resurrection, it is an enemy already defeated. This is a very different position than that of a certain brand of techno-scientism that has an unattainable immortality in its sight, always just around the bend, no doubt. ToB: This takes us straight to a question about the state of post-Catholic and post-Protestant neo-religions, which ironically reunite both strands of Christian faith and many more besides. If faith resides not in saints and relics, but in the ‘now’ of daily hard work in the world, then people will start investing sacred meaning again in acts and things in the world, and in their environment. You wrote: “Is this the heritage of Protestantism? A renewed and ancient paganism?” (p. 63) What do you think now? Andrew Wilson: The phenomenological reality of Christianity is primal: people gathering around some storytelling and a meal—usually with some fancy dress and a little symbolic fire. And so it is not surprising that food and drink and dress and banter and like-mindedness fulfill much of the “religio”—that is, the social glue-like character of religion noted by Lactantius, Augustine, and their heirs. 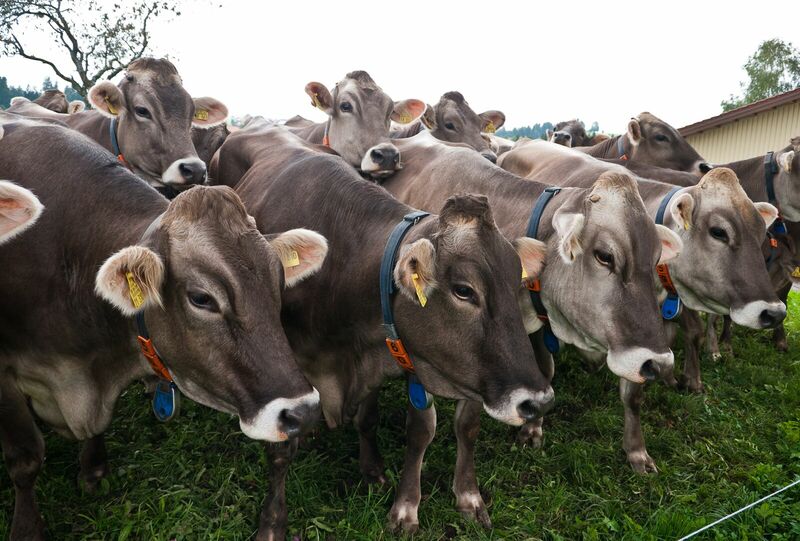 What’s missing from the “religio” of the beer and fixed gears and veganism that imbues today’s alternative social glues is the otherness of God’s Word and the non-biological character of the community. If blood runs naturally thicker than baptismal water, it is the obligation of the church—Protestant or Catholic—constantly to propose and form a larger, less homogenous family. This is really hard to see if you’re not a deep part of church life—and within, there are confusing, incommensurate vocations of the church to create community and send forth truth-telling prophets. Having lived abroad for solid chunks of my life, I find unruly international churches to be the easiest home for Gospel truth. There water is naturally stronger. I would like to thank Andrew very much for speaking to Histories of Things to Come. Part 2 of the interview will follow soon! Andrew Wilson’s website is here. You can follow him on Twitter here. You can buy his book on Amazon at the links below.